Had this given to me just curious if anyone knows what type/brand? Markings are hard to see. Has a “7” on one side. Not much to go on. That's a great gift, I'd think it was my birthday if someone gave me that. Always had access to anvils at places I worked but don't own one myself. Very cool. No help on how old it is or who made it. Mom has anvil that looks similar to that. It belong to my Great Great grandfather. Its Well over 100 yrs old. How big is it? Could it be 7 lbs? Click on ask the Guru see what they think. Last edited by MASTERS; 03-14-2018 at 02:25 PM. Andrew could help you out, has more experience than most of us. That style has a steel plate welded on a cast or wrought body. Commonly made by Fisher, Vulcan, and a few others. 7 could be 70 pounds, or 7 stoneweight, or something else altogether. I think that's the Price. I'll give you $10 if you load it for me. Actually gave me two. This one and a matching one a size smaller. I’ll get better pics of both when I get home this weekend. The smaller one has a 5 on it so you may be right on the numbers. It looks like an older style Peter Wright and looks like it has been abused. Wait! What, you can abuse an anvil? Are you kidding? I bet my son could jack it up with a rubber mallet. Can't tell you anything about it but I know they are darn useful to have around the place. Grandfather had one that I could hardly lift out at the old place and we sold it when he passed. Big ol' boy bought it for his farm and I'd be lying if the next morning I realized I'd need that thing to get some iron straightened out from one of our "projects". *laugh* Same guy that bought that anvil also bought a foot pedal powered sharpening wheel on a stand that took two of us to load, darn stone was about 3' across and a good 6" thick. Should have kept that one also. That does not look abused to me, corners are sharp, edges mostly intact. Numbers are related to stone weight, seven stone and five stone. Does it ring when you drop a hammer on it and bounce it? There are many, many good youtube videos on restoring anvils or hand forging, even shopping for old anvils that will help you a bunch. Most are mounted to a big section of oak tree trunk for stability and cushioning. Watch the videos on unique ways to anchor them with chain to a stump! 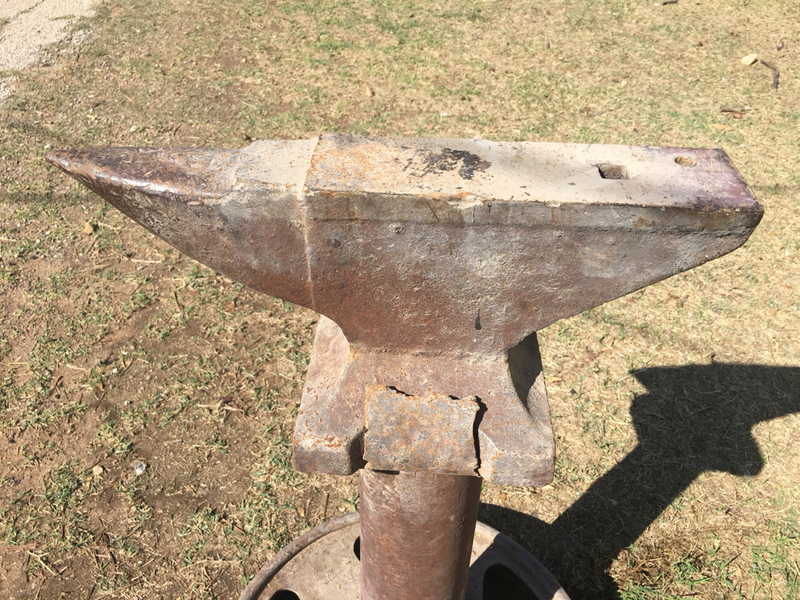 I have a friend in Lampasas that buys, restores, and sells old anvils as well as all other kinds of blacksmith tools and also makes his own forges. He could probably help you out with anything you wanted. I’ll check them out better when I get home from spring break. I just thought they were cool. I’ve had a metal shop forever but never really had an anvil. Guess I’ll see if I can use one. If you decide to sell either or both, I'd appreciate the opportunity to buy 'em... PM me if so please.